“It is no achievement to walk a tightrope laid flat on the floor,” reads a quote at the end of McDonald’s founder Ray Kroc’s book. It was one of many things that offered inspiration to local filmmaker Patrick Stark who is now eight years into production of his “One Life No Regrets” documentary. The objective of the film is for Stark to conquer his greatest fear in life – singing in public – with one majestic moment on stage with U2 as they kick off their Joshua Tree Tour 2017 in Vancouver on May 12th. The only thing is, it’s not yet a sure thing, but there’s something to be said for going all in. 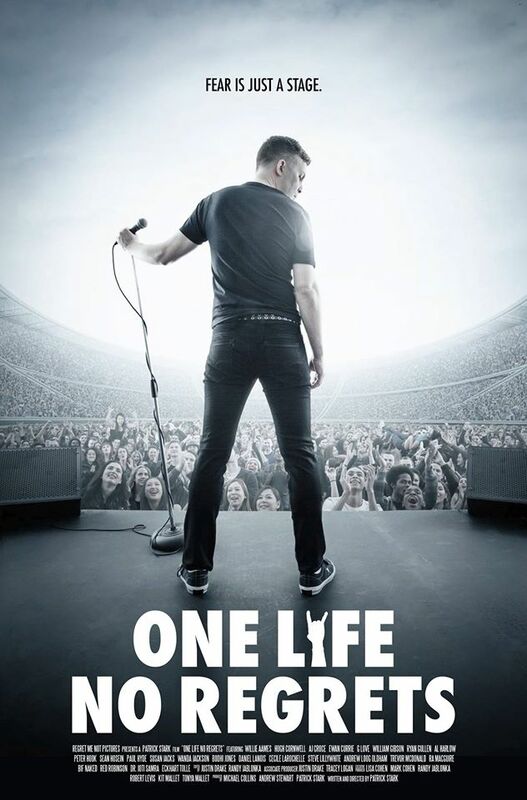 One Life No Regrets is Stark’s documentary that he packed with star-studded interviews while chronicling his journey of a lifetime. It all began when he woke up one day at 40 and starting thinking about life, opportunities, and the example he wanted to set for his young family. “I thought, how am I going to be a good parent? I can tell them to live a good life, but have I?” He had already been working in the film industry for years, so that seemed like the right platform for his mission, and when he pinpointed his childhood fear of singing in public, that became the obstacle he would attempt to overcome — with the biggest band in the entire world. “What is the ultimate experience for someone who needs to confront a fear of singing? What would be that one thing that I might feel proud of doing? Karaoke crossed my mind a number of times but it was so easy, will I feel good about myself afterward? Will it be enough?” He knew he had to do something big. Fears grew along the way. Will it ever happen? Will he ever meet the band? Will he ever talk to them or pitch his vision? What about the actual performance? Will people hate his voice? The way he looks? For the actual singing aspect, his vocal coach Cecille LaRochelle offered some advice. “She said, ‘what are you afraid of?’ I’m afraid of looking silly, I’m afraid of looking stupid… And she goes, is that any of your business?” He immediately realized it’s not. It’s up to the audience to form their opinions, he can only focus on himself. The journey continued over the years, and among those he’s interviewed for the film to date are spiritual author Eckhart Tolle, Rolling Stones manager/producer Andrew Loog Oldham, queen of rock Wanda Jackson, Joy Division’s Peter Hook, and U2 producers Steve Lillywhite and Daniel Lanois, just to name a few. The film was coming along but there was one big piece of the puzzle that was still missing. However after six years, even though U2 still had no idea who he was or what his intentions were, things changed. Fates aligned in 2015 when he found himself face-to-face with the band at a popular Vancouver restaurant, where he boldly shared his story, and they were receptive. Everything was set however after the unfortunate passing of blues legend B.B. King, Stark was “bumped” at the last minute from the performance so U2 could pay tribute to their close friend and musical collaborator. With U2 rehearsing at BC Place in Vancouver right now, the stage is literally set once again for Stark to complete his mission and film the finale of his adventure. Not to mention do the one thing that scares him the most in this world – finally – in front of 50,000 people. But what started out as a movie project that enabled him to live his best life, has become so much more. With an animation business, and concert poster business – the latter paying for the film production all these years – he’s got many more irons in the fire including another film he recently co-directed. His passion won’t burn out when he gets off the stage on May 12th. “There’s all these wonderful things that are popping up, just by starting a company, just by taking chances, by taking risks, all very calculated of course, not that wild and crazy.” He laughed at the idea of jumping out of a plane next, although he does have an aversion to flying. The opportunities and experiences that have presented themselves have been countless, even if he is still rushing toward that end zone. You can follow Patrick’s journey on Facebook and Twitter, and be sure to tune in on May 12th to see if he’s made it on stage with U2 in Vancouver.